Welcome to the LIONESS Lab documentation! Once you are ready specifying your experimental screens, you can test your LIONESS experiment. Here we describe the basic procedures of how test your experiment and make adjustments on the fly. Once you are done testing, you can download your experiment, put it on your own server, and run your experiment online. In LIONESS Lab, click compile and test, and compile your experiment by selecting compile from the drop-down menu. During the compilation process, LIONESS Lab activates a script that will build the database underlying your experiment and creates the experimental pages from the stages that you defined in each of the tabs. Once the compilation process has completed, a new tab will open with the control panel of your LIONESS experiment. All further testing can be done from the control panel. The control panel allows the experimenter to control the experimental flow (start and stop the experiment), observe the data collection and download the data and payment file. The control panel also triggers the central controller algorithm. During a session, the control panel of the experiment needs to be open on the experimenter’s computer. The horizontal top bar contain basic control functions. Controls the registration of new participants. Participants automatically receive a unique playerNr upon entering the experimental pages. If the button Game active is switched off, no participant can enter a session, but those that are already in will be able to proceed. Regulates grouping. It tracks the number of participants waiting in the lobby, and groups together those that are ready. Various pre-programmed grouping procedures are available. Handles dropouts. In case a participant has dropped out (that is, the server cannot detect that their are active), the controller algorithm can take action. Upon dropout, you can choose to have the group continue with reduced size, terminate the whole group, or to take no action at all. You can define your dropout handling preferences in the parameters table of an experiment. With the Game (in)active button, you can block new participants from entering. When switched to inactive, participants will be directed to a page that they cannot participate at this time. You can customize the default text shown in these cases in the experiment’s parameters table. You can manually remove a participant from a session by entering their value of playerNr in the field next to Terminate player. This will take that participant to a screen indicating that they can no longer proceed. The software will treat this participant as a dropout, that is, the group will proceed according to the dropout handling settings. Note that terminating a participant is a last resort measure. With this button the database of the experiment is exported as an Excel file. Each of the experiment tables will be shown in a separate Excel tab. The decisions table will typically be the most interesting one as it contains the participants’ responses in the experiment. With this button you can empty the tables of the experiment’s database. This will not emtpy the globals table. Be aware that this cannot be undone. LIONESS Lab does not store old results. By clicking this button, an external program will create a map showing the location of the participants of your session. These locations are based on the participants’ IP addresses (which are encrypted upon entrance) and may be not correct. The tool is just to get an overview from where participants are logged in. Log out of the experiment. Logging out implies that the controller algorithm is no longer running. Typically you’d want to click this button only after an experimental session is over. When developing your experiment, it is often useful to test you experiment by playing as a participant and inspecting the screens. The test mode will allow you to enter multiple times (i.e. control multiple test players) from the same browser. In the top bar of the Control panel, make sure that the experiment is active. Then, switch on the test mode. Two buttons will appear: Start testplayer and Start bot. Once click this button, two more buttons will appear that will allow you to start your experiment as a test player or start a bot , which will make automated decisions. Bots are particularly useful for is useful for experiments in groups (so you have to control only one test player while the other decisions are generated automatically) in case you want to check whether all data is correctly recorded in the database. When you click Start testplayer, a new tab opens in your browser, which takes you to the first stage of your experiment. You can see the screens that a participant in your experiment would see. Multiple testplayers are supported. 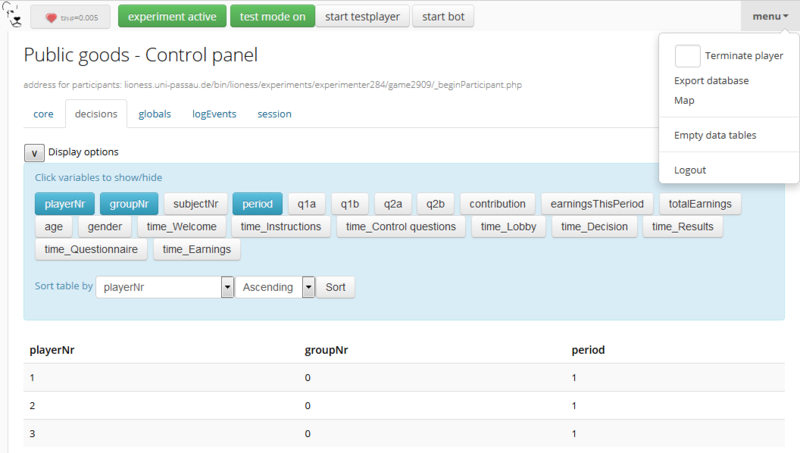 In the bottom part of your control panel you can browse the tables of your experiment and monitor the progress of a session. In the core table, you can keep track of the test players by selecting to view the variables playerNr, groupNr, period and onPage. Once you have started one or more Testplayers, they should be visible a entries in this table. During a session, basic information about the entered participants will appear in the core table. By clicking the display options button, you can choose which variables in this table you want to track. Clicking the buttons with the variable names will make them visible in the page section below. This section will be updated every second. Among the most useful variables are: playerNr, groupNr, period and onPage. The onPage variable tracks which page a participant is currently watching. These pages are marked with stars (indicating active screen) or dashes (indicating waiting screen). In the example above, there are 5 participants in the experiment. Participants 1-4 have just passed the lobby and have been grouped together - the value of groupNr is 1 for each of these participants. They are currently in period 1, on the page Decision. Participant 5 is currently on a page called Instructions (which in this case comes before the lobby). One of the key purposes of testing is to check whether participants’ responses are recorded correctly, and to verify if any calculations are performed as they should. For this, the decisions table is most useful. For each period, a new row is added to this table for each participant. Values should appear there once they are entered in the participants’ screens. This table stores the data that is generated by the participants. All their responses are stored in this table. For each period, for each participant, one row will be added to this table to store any responses generated in that period. This table also contains the response times (in seconds) for those pages that are visited in a given period. This table stores the parameters of the session. These can be manipulated in LIONESS Lab, in the parameter tables of an experiment. In addition, this table contains the message texts displayed to participants once they have dropped out of a session, or cannot or cannot participate. These messages can explain to participants the reasons why they dropped out, or why they cannot participate. This table documents key events during the experiment, such as participant entry and dropout. Entries are automaticly added by the controller algorithm. This table contains session data. Each participant is associated with one row in this table. Needless to say, it is critical for the functioning experiments that the program code works correctly. The JS editor in LIONESS Lab provides some support in detecting syntax errors, but not all bugs in your code will be automatically detected. These bugs will only surface when you test your experiment. When you have spotted the mistake on a participant page, you can go back to LIONESS Lab and spot the mistake in the JS code in the corresponding screen. If you make a change, you can press Compile and test and then recompile experiment (keep tables) to immediately see whether your change has fixed the bug. It is always a good idea to add comments to your code. It makes your code transparent to others and can also help you understanding it when you get back to it at a later time. Now, the usual way to add comments to JS code (e.g. for adding clarifications), is by using the double slash “//”. Note that not all web servers will interpret this code the same way. This has to do with line breaks surrounding this code. To prevent your code from being corrupted, use “/* … */”, where the any comments go on the placeholder dots. © Copyright 2018, LIONESS Lab Revision 35c5d886.